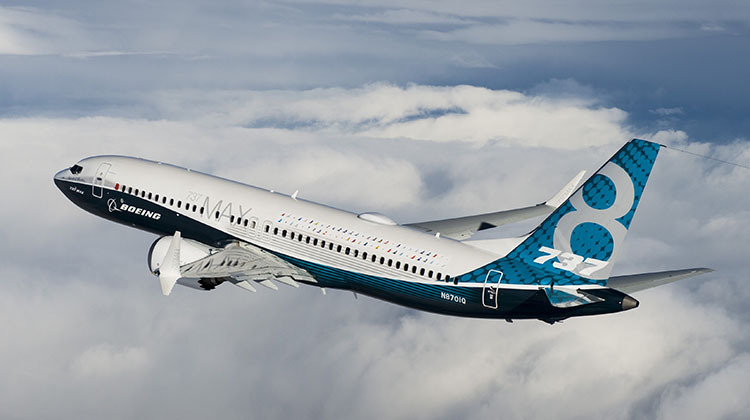 The fourth iteration of Boeing’s 737, the 737 MAX, has completed its first flight, marking the commencement of a four aircraft flight test campaign. The first 737 MAX development aircraft, 737 MAX 8 N8701Q Spirit of Renton, took off from Boeing’s Renton, Washington State site (where all 737s are built) at 9:46am local time on Friday with 737 MAX chief pilot Ed Wilson and Boeing chief test pilot and vice president of flight operations Craig Bomben at the controls. It landed at Boeing Field, Seattle 2 hours 47 minutes later, after reaching a maximum altitude of 25,000ft and an airspeed of 250kt. As well as its new generation CFM LEAP 1B engines, key to delivering a 14 per cent reduction in fuel burn compared to current 737 NG aircraft (and over 20 per cent compared to early-build 737 NGs), the 737 MAX also introduces a new flightdeck, fly-by-wire spoilers and new technology winglets. To accommodate the LEAP 1B’s 176cm fan diameter, compared to the CFM56’s 155cm diameter fan on the 737 NG, the 737 MAX also features a taller nosewheel landing gear leg, while the engine nacelles’ trailing edges feature noise-reducing chevron shaping, as on the 787. Boeing so far holds 3,o72 firm orders for the 737 MAX in its four variants – 737 MAX 7, MAX 8, MAX 200 and MAX 9 – from 62 customers, including Virgin Australia, which has 40 737-8s on order for delivery from 2018. First customer delivery, to Southwest Airlines, is “on track” for the third quarter of 2017, Boeing says. I really wish Boeing would at least update the cockpit windows on the new 737s and 747s. They look so outdated as things stand. Would be great to see some of these 737 Max’s with split scimitar winglets at our airports and in our skies. Why are QF and VA not upgrading their 737NG’s with Aviation Partners split scimitar winglets and reducing carbon emissions and fuel costs? It would be interesting to see if either QF or VA had, or were giving any thought to refitting their 738s with scimitar winglets..
Wonder how this new age B737 Max is going to match up with it’s competitor, the A320 Neo. They both are looking very interesting in terms of comfort and effeciency. Lots of head scratching for Airlines in deciding on their choices. Raymond, the QF & VA 738 fleets are relatively young, however are still on average over 8 and 6 years old respectively. Regardless of age, there are advantages to be had, although perhaps not enough for QF & VA. There are however plenty of other airlines with newer fleets fitting these winglets.